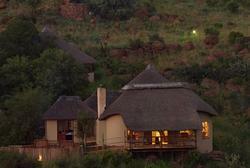 Luiperdskloof Game Lodge, a 4 star **** Lodge only 90km from JHB Int. Airport. Three conference venues. Accommodate 80 pax, Three private Lapas and bars.Teambuilding. We offer exclusive Dinner, Bed and Breakfast packages as well as self-catering for both families and romantic couples. Luiperdskloof Game Lodge is your ideal venue for conferences, team building, training, weddings, family gatherings and exclusive weekend getaways. Located on 5 km's of unspoiled head waters of the Wilge River, Luiperdskloof is set in the undiscovered wilderness of Eastern Gauteng only one hour from Pretoria and OR Thambo International Airport.